Saint Seiya: Ougon Densetsu (聖闘士星矢 黄金伝説, Saint Seiya: Ougon Densetsu? lit. Saint Seiya: Golden Legend) is an RPG based around the anime and manga series known as Saint Seiya. It was developed and published by Bandai in 1987 for the Famicom. The series was being translated and aired in France with some success, so Bandai localized the game for French speakers and released it under the title Les Chevaliers du Zodiaque: La Legende d'Or. Since the series was unknown in the United States at the time, no English conversion was published for the North American market. The story of the game draws heavily from the first story arc of the series, from the beginning of the story to the fight with the Gold Saints. The game remains faithful to the original story while introducing some original elements. When the game came out, the story line was in the middle of the Gold Saints story arc. As a result, the last boss of the game is an original character. 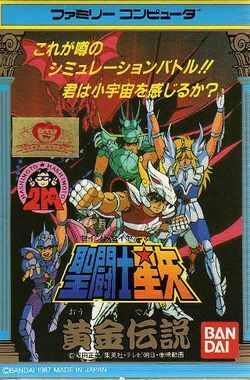 The actual final fight of the Gold Saints arc was carried over into this game's sequel, Saint Seiya: Ougon Densetsu Kanketsu Hen. The gameplay mixes side scrolling action scenes to transport the character from place to place where he may have to jump over obstacles and fight basic enemies, with a turn based combat system against bosses and other significant battles. In order to be successful at these turn based battles, the player must distribute his power, or Cosmos, to various attributes before each attack. Failure to do so typically results in no damage dealt to the opponent, and a lot of damage received. When Life is lost, the main character can be revived, but if all Cosmos is lost, then the game is over. An orphan named Seiya is sent to a Sanctuary in Greece to become the Pegasus Saint. After six years, Seiya becomes the Pegasus Saint and returns to Japan to find his older sister. Because his sister disappeared the same day Seiya went to the Sanctuary, Saori Kido, the granddaughter of the person who sent all the orphans to train, makes a deal with him to go to fight in a tournament called the Galaxian Wars, where the orphans who survived and became Bronze Saints must fight to win the most powerful Cloth: The Sagittarius Gold Cloth. If Seiya goes to compete there and wins, Saori would start a search to find Seiya's sister. During the series, Seiya becomes the partner and friend of other Bronze Saints: Shun, Shiryu, Ikki, and Hyoga. As the myth of the Saints, they must fight together to protect the reincarnation of the goddess Athena from any danger, as their predecessors have during millennia. This page was last edited on 7 April 2010, at 21:10.